G H Baldwin Builders and Contractors is a well established, quality, award winning business with over 50 years of experience in the building industry. We not only pride ourselves in delivering quality building but can also help you with planning permission and have a strong network of architects, structural engineers, quantity surveyors and trade specialists enabling us to deliver a seamless construction service. We aim to deliver a quality, professional service at the right price. If you are looking for a reliable professional building company to extend or undertake refurbishment of your home, school or office we can help. Our approach to both commercial and residential work is of a friendly, high quality professional service from the moment you contact us to the finished result. 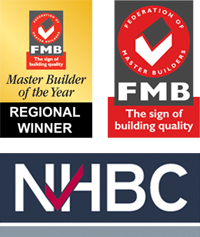 We are members of the Federation of Master Builders and the National House Building Association. We have full public liability insurance and our tradesmen are Gas Safe and Part P compliant to abide by Building Regulation approval. Whether you require a new build house, extension or refurbishment G H Baldwin Builders have the knowledge and expertise to fulfil your proposed plans. What sets us apart from other building firms? We pride ourselves on the standard of our workmanship achieving Federation of Master Builders regional builder of the year. Our quotations are detailed so you know exactly what is included.